Manufacturers must aim for uniform quality of their meat products. To attain this, raw materials must be standardized for different qualities. Goodquality carcasses are usually divided into primal cuts (ham, shoulder, loin, neck, etc.). 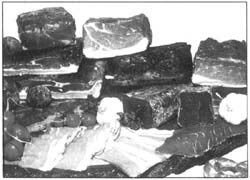 The remainder of the carcass and trimmings from the primal cuts are standardized into different qualities of meat. 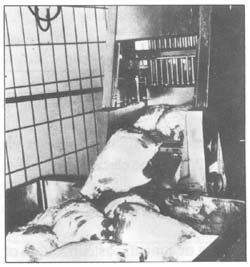 Poorer-quality carcasses are used entirely for processing after being deboned and trimmed. Basic parameters for simple quality standards are size and shape of meat pieces, amount of visible fatty and connective tissues, and chemical composition. Meat must not contain skin, lymphatic glands, particles of bones, bristles, large blood vessels or blood clots. First quality (Meat I). 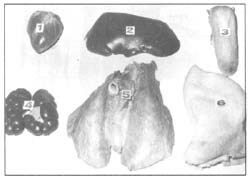 Meat pieces of relatively uniform size and shape, trimmed of connective tissue, with about 8 percent visible fatty tissue obtained from larger primal cuts, mostly hindquarter. It is used to make meat batter for sausages and high-quality canned products (Fig. 129). Second quality (Meat II). 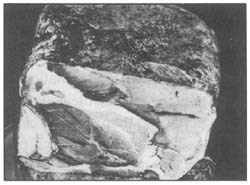 Meat pieces of irregular size and shape, partially trimmed of connective tissue with about 15 percent visible fatty tissue, obtained mostly from forequarters. It is used to manufacture meat batter, or medium-quality meat products (Fig. 130). 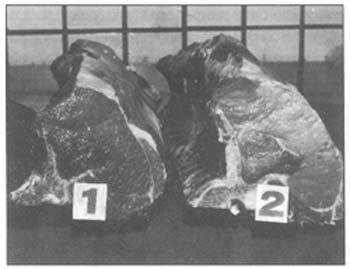 Lean trimmings are small irregular pieces of meat, with pervading connective and fatty tissue (about 25 percent), obtained during deboning and trimming of primal cuts, Meats I and II, and meat parts of the head and flank. They are used to make meat batter for all kinds of medium-and lowquality cooked sausages (Fig. 131). Fatty trimmings are meat pieces containing about 50 percent visible fatty tissue, derived from all trimming operations. They are used as the fatty ingredient of meat batter of medium and low quality (Fig. 132). 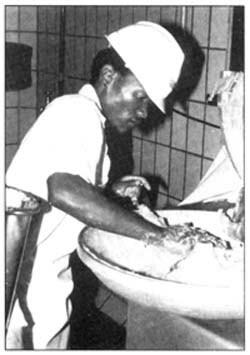 Firm (external) fatty tissues are trimmed from any part of the carcass and hump of zebu and are used as the fatty component of the meat batter or sausage mixture (mutton, goat, etc.) or all-beef higher-quality sausages. Soft (internal) fatty tissues are perirenal and sacral in origin and are not generally used in sausages. Jowl (firm) contains much muscular (even up to 30 percent) and connective tissues. It is suitable for manufacturing dry sausages, summer sausages, salamis and emulsion-type sausages of the highest quality (Fig. 133). Back fat (firm) is used for semi-dry and dry sausages, and in frankfurter sausages of the highest quality (Fig. 134). Side fat (firm) contains about 60 percent visible fatty tissue. It is used to manufacture medium-quality cooked sausages made of uncooked or precooked materials (Fig. 135). Belly fat and leaf (soft) are used to make cooked sausages of low quality (Fig. 136). Typical quality standards based on average chemical composition are shown in Table 4. Common salt (sodium chloride, NaCl, salt) which may be extracted from sea water (sea salt) or mined (rock salt), has three major effects upon meat. Flavour enhancement of meat and meat products. The salty taste of a meat product depends on the relative amounts of salt and water. Typical ranges of salt concentration for various products are shown in Table 5. Products with less water require higher levels of salt concentration to achieve the same degree of saltiness. Functional properties of meat proteins. Depending upon its concentration salt can increase or decrease the WHC of a meat product. The dehydrating effect of salt is used for meat drying (lowering WHC). The opposite effect of increasing WHC is very important and results from the swelling and solubilizing of the muscle proteins (actin and myosin). Preservation. Salt is one of the most important food additives in food preservation. The salt concentration determines what types of microorganism, if any, can grow by dehydrating or by lowering the amount of water available for growth. Nitrates. 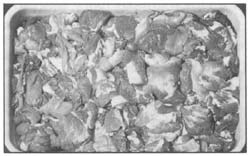 Sodium (NaNO3) or potassium nitrate (saltpeter, KNO3) allow cured meat colour to develop in products where drying is a long-term process (Fig. 137). Nowadays, they are used less frequently because to be effective they have to be reduced to nitrites under the influence of bacterial enzymes, and this is a time-consuming process. Nitrites are indispensable for meat curing, and no substitute has yet been found. Sodium nitrite (NaNO2), a toxic substance, can be fatal even in small doses (Fig. 139). For this reason they are often mixed with common salt at a concentration of about 0.6 percent (so-called “nitrite salt”) when used for curing. If excessive levels of nitrite are accidently reached the accompanying salty taste will be rejected by the consumer, thereby preventing nitrite poisoning. The maximum amount of nitrite permitted in finished meat products is usually 200 ppm (parts per million, or mg per kg), or may be less subject to the type of meat product or country legislation. Saltpeter can be added to the nitrite salt at a concentration of 1 percent and used for curing dry hams and dry sausages. Typical levels of nitrite and nitrate in meat products are shown in Table 6. Cured-meat colour development is achieved when the muscle pigment (myoglobin) in an acid environment combines with nitric oxide (NO) (formed from nitrite) to form NO myoglobin. This reaction is affected by temperature, pH and oxygen-reducing agents. NO-myoglobin is relatively resistant to light and oxygen and, most importantly, it is heat stable. Thus, cured cooked meat and meat products maintain a bright red colour in contrast to uncured meat which turns grey after cooking. Nowadays it is considered that 3–50 ppm is sufficient to achieve colour in cooked sausages. Cured-meat flavour development is based on various reactions between nitrite and the meat component. Typical flavour of cured-meat products is achieved with 20–40 ppm nitrite. Preservative effect. Even in small doses (80–150 ppm), nitrite prevents the growth of numerous micro-organisms, and food-poisoning bacteria (Clostridium botulinum, salmonella, staphylococci, etc.). However, the effect of nitrite on shelf-life or prevention of food-poisoning bacterial growth must not be overestimated and decreases with increasing storage temperature. Spices act on the salivary and gastric glands to promote secretion, stimulating appetite and improving digestibility of meat products (Fig. 138). Their use varies from country to country depending on the climate, customs and eating habits. There are spices whose taste and smell remain unchanged even after exposure to high temperatures (chilies and sage). Less resistant are cardamom, clove, pepper, rosemary and thyme, and the least heatresistant are coriander, mace, marjoram, nutmeg, allspice and ginger. Phosphates are used to restore WHC to chilled meat, approximately to the same level as hot-boned meat. Certain countries forbid phosphates, whereas some allow their use only where there is a proven technological effect. Where permitted they should be restricted to 0.3–0.5 percent of the sausage mixture weight. Phosphates break down actomyosin into actin and myosin, which can be solubilized by salt to increase the WHC. 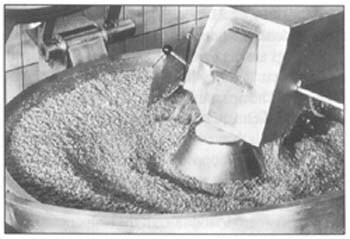 This effect is retained even in cooked products, increasing the yield. Ascorbic acid (vitamin C) and its salts (sodium ascorbate) contribute to the development of cured-meat colour. Sodium ascorbate is used in the manufacture of cooked sausages, made from uncooked or precooked raw materials. Ascorbic acid used is at a concentration of 0.03–0.05 percent, whereas sodium ascorbate is added at a concentration of 0.07 percent. Ascorbic acid is a strong reducing agent, enabling quicker formation of the NO-myoglobin so that less nitrite is needed, and it inhibits the formation of an undesirable colour in cured-meat products. It must not be added to, or mixed with nitrites, because they will be broken down instantly and will become useless for curing. Thus, the nitrite salt must be added to meat at the very beginning, whereas ascorbic acid is always added at the end of comminution. Ascorbic acid decomposes rapidly especially in a humid warm environment. Its salt (sodium ascorbate), being more stable, is often used in sausage production, as is erythorbic acid and its salt (sodium erythorbate). Glutamates. Monosodium glutamate and other salts of glutamic acid are substances which improve the flavour of meat products, and are usually added in concentrations up to 0.2 percent. Natural smoke is a very complex mixture, consisting of a great number of compounds, and is obtained by controlled combustion of moist sawdust at low temperature. Sawdust from hardwoods is most commonly used to generate the smoke. Nowadays, it is considered that optimal smoke composition is obtained at temperatures of 300–500°C. Smoke consists of gases (phenols, organic acids, carboniles and other compounds) and particles (pitch, tar, ash and soot). Gaseous components penetrate into a product through the casing to a certain level, and react with other components of meat products. Other components are deposited on to the surface. Smoke provides typical flavour and distinctive colour, and hardens the surface of the meat product. All substances which are added to meat products must have food grade purity. They should not contain any food-poisoning bacteria, so must be treated according to the highest hygienic standards. It is important to keep them in properly closed containers or intact packages, away from any dampness and dust. They are usually kept in special, dry premises away from the workshop, in which they can be pre-weighed, blended and packed into plastic bags in the proportions required for sausage formulations. The nitrate must be kept under lock and key (Figs 139 and 140). Dosage by hand of any non-meat ingredient is not allowed (Fig. 141). The only correct way is with scales which must be checked occasionally for accuracy (Fig. 142). One of the most serious consequences of failure to protect all non-meat substances is contamination with dirt, excreta from rodents, birds or other animals and infestation with insects (Fig. 143). During processing many meat products are subject to specific heat treatment. The first task of heat treatment is to reach satisfactory shelf-life by reduction of micro-organisms. The second task is to obtain desirable organoleptic characteristics, to preserve nutritive value and improve digestibility of the product. Bacteria are destroyed if exposed to sufficiently high temperatures for long enough. There is a direct relationship between bacteria survival and time of exposure to temperatures. As an example, if 10 000 000 bacteria (per ml) suspended in broth are exposed to heat (70°C), after the first five minutes 1 000 000 will survive (90 percent are destroyed), after the next five minutes the number of surviving will be 100 000 (again 90 percent are destroyed), and so forth. This tenfold reduction in bacterial numbers between fixed time intervals is called decimal reduction. The time interval for decimal reduction varies between different bacteria and depends on the temperature applied. The number of bacteria present in a meat product just before the heat treatment (initial number) should be as low as possible so that a shorter time or lower temperature is needed to achieve a satisfactory shelf-life for the product. As sausage fillings as well as most other meat products represent a very good medium for bacterial growth, they should immediately be exposed to heat treatment in order to prevent bacterial growth. It is also important to perform all operations as quickly as possible, and to maintain the highest hygienic standards so that the initial bacterial count remains as low as possible. The manufacturer must always bear in mind that bacteria grow very fast. Their number may be doubled every 20 minutes. These are caused by heat treatment (doneness, flavour, firmness, consistency and cured-meat colour development) are time-temperaturedependent processes. The basic effect of the heat treatment is coagulation of meat proteins. Between 70° and 80°C the majority of meat proteins are completely coagulated, forming a structural matrix which entraps fat and water droplets released during heat treatment. With coagulation of meat proteins, WHC is decreased and the meat loses a certain amount of water (thermal weight loss). Those structural changes of proteins are responsible for characteristic firmness of heat-treated products. Frankfurters have an elastic firmness, and on reheating prior to consumption become even more firm. Products containing connective tissue become more tender owing to solubilization of the collagen (gelling). Products such as paste which are in a liquid state prior to heating change for more viscous and spreadable consistency. Sausages made from larger meat pieces also attain a characteristic consistency. The exudate released during massaging or tumbling coagulates and binds the pieces of meat. Such products (cooked hams, ham sausages) become sliceable. Heat treatment also makes products chewable. In addition to these physical changes resulting from heat treatment, some biochemical reactions also take place which contribute to the typical flavour of heat-treated products. Many compounds present in the raw material are broken down by heat to produce the characteristic flavour. Fatty components give the meat product a distinctive flavour, specific to the animal species from which fat is obtained. Cured-meat colour is not stable unless the raw product is heat-treated. All these changes occurring during heat treatment give the product its typical overall sensation of doneness. The duration of the heat treatment primarily depends upon the size and shape of the meat product. Treatment continues until the coldest point (innermost part) reaches the defined temperature. It is essential to check temperatures of the heating medium and of the innermost part of the products and to observe exact times (Figs 144 and 145). Heat treatment by dry heat is performed in special ovens (roasting) or on a gridiron (grilling). Meat loaves and similar products are roasted. Meat patties, hamburgers and fresh sausages are grilled. Heat treatment by hotwater is the most common and is usually performed in large cooking vats. When applied to canned hams or ham sausages, it is called pasteurization (Figs 144, 145 and 146). Heat treatment by steam is one in special steam cabinets and is in particular applied in cases when treatment in cooking vats is not desirable because of substantial losses of aroma and flavour of the products into the cooking water. Undercooking may be due to the temperature being too low, the time of treatment being too short, or both. The consequences are in a reduced shelflife due to spoilage and the possibility of food-poisoning. Spoilage results in a bad smell, discoloration, softened consistency and souring. Overcooking results from either too high a temperature or too long a duration or both. The consequences are increased cooking losses, fat separation in some sausages, undesirable changes of flavour and a softer consistency. In order to keep the initial bacterial numbers as low as possible it is important to keep the temperature of the raw materials as low as possible before heat treatment. After filling sausages and mixing other meat products heat treatment must be applied immediately. These are prepared from primal cuts with or without bones. They are cured and dried without heat treatment and must be produced from wellrefrigerated carcasses. This process is based on two principles: the stabilization of the product by decreasing water activity and adequate ripening. 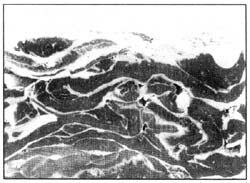 Decreasing water activity (= amount of water available for microbiological growth) is achieved by penetration of salt into the meat pieces and consequent dehydration. With 3–5 percent salt penetration, 5–9 percent of the water will migrate out of the meat. Dehydration continues during drying and ripening and prevents bacterial growth. 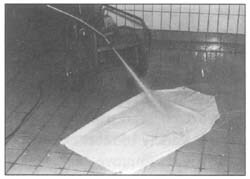 Nitrite, which is either added directly or formed from nitrate, also contributes to this bacteriological effect. If these preservative conditions are completed, the finished dry product will be bacteriologically stable and need not be cooked before consumption. 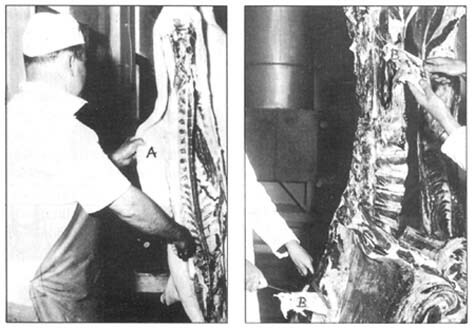 At the same time, these processes destroy possible live trichinae in pork. Repeated rearrangement during curing of stocked meat cuts is important to eliminate pressed-out water. Smoking, drying and ripening contribute to the development of very pleasant flavour, which is due to biochemical changes taking place in muscle and fatty tissue. First lipolysis takes place in which complex molecules of fat are broken down under the influence of enzymes, not only those normally present in fatty tissue, but also those of bacterial origin (especially Micrococceae). Second, oxidation is initiated by higher temperatures. Intensive oxidation of fat can cause undesirable rancidity. All these reactions taking place during processing develop very slowly, because the useful enzymes are enclosed in the cells. Drying and ripening must therefore be long-term processes for the enzymes to be effective. Dry hams are uncooked, cured, dried and usually smoked pork legs. Raw material. The legs are cut from the pork sides (Fig. 99) and quickly chilled to an internal temperature of 2°C within 18 hours. Legs having blood clots, PSE or DFD muscles are not suitable. The minimum weight of a deboned leg is 5 kg. Additives. A mixture of salt (10 kg), nitrate (400 g), sugar (500 g) and spices, usually black and white pepper, sage and ginger, is used for dry curing. Instead of salt and nitrate, the so-called nitrite salt can also be used. In some traditional methods only common salt is used. Manufacturing. In the cold season and at high altitudes hams may be dried under natural conditions, according to the traditional method. Because of air purity and better circulation, nitrate is not usually used, so a larger quantity of coarse salt must be added, giving the finished product a more salty taste. After overnight chilling, legs are cut off between the aitch bone and femur. Feet are removed but the skin is usually left on, but may be removed from the upper third of the leg to improve salt penetration. The legs are rubbed with the curing mix, arranged in a wooden cask (Fig. 147) placed in a cool place (about 0°C) and hand sprinkled with the same mix. Salting lasts about three weeks. After a week they are salted separately and rearranged in another properly washed cask. After salting the legs are rinsed and the remaining salt is removed. They are tied and hung in a cool place for further drying and ripening for at least five to six months (Fig. 148). The windows and doors should occasionally be opened and closed and ventilation provided. Legs should be rearranged so that they are all uniformly dried. Smoking can be applied in the processing of dry hams. Its purpose is to give the product a typical flavour, distinctive colour and to harden it. Smoking quality depends on many factors, but the most important are the smoke temperature at the product surface and air humidity. It is most important that the surface is dry enough before smoking starts. 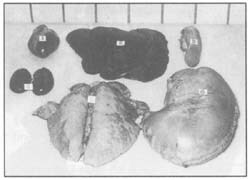 If smoking is a long-term process, drying occurs simultaneously but with a shorter process it must be done first in a drying room. In raw dry ham production only cold-smoking is used (below 25°C). Smoke density and duration depends on local preferences. The industrial method uses special air-conditioned coolers, in which standardized conditions (temperature, relative humidity (RH), air ventilation and circulation) can be maintained all year round. 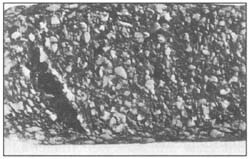 Crust on the upperface (3–5 mm thick), of hard consistency and darker colour which arises during smoking caused by low air humidity (below 65 percent) and/or very strong air circulation. Cracks around the head of the leg bone of varying size and depth, due to careless deboning and excessive drying. Insufficient drying of certain parts can appear in large hams, seen as lighter areas with a softer consistency. It is caused by improper processing (especially during drying and ripening), crust formation (which prevents uniform drying of the inner parts), and/or insufficient air ventilation (especially when dealing with legs weighing more than 9 kg). Mould (yellowish or greenish) is caused by drying at high RH, due to poor ventilation and air circulation and/or mould contamination of equipment and workshop. Oversalty taste is the consequence of improper desalting. Rancidity arises from the oxidation of unsaturated fatty acids and in severe cases results in a yellow discoloration. High temperatures applied during smoking, drying and ripening, or poor-quality feed may be the cause. Spoilage within the product usually occurs around large blood vessels and is usually due to the raw material being contaminated during deboning, trimming and/or curing in non-hygienic containers. The characteristic brownish colour and unpleasant smell are caused by anaerobes. Acarid findings show that products have not been properly protected against insects. Storage and shelf-life. If the process is carefully followed, the dry-cured ham is very tasty, nutritive and bacteriologically stable. Stored at room temperature, but not more than 30°C, and RH between 55–65 percent, the shelf-life should be four to six months. 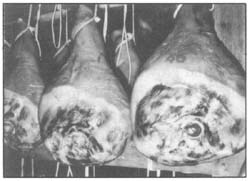 Raw dry hams are ready for sale immediately after production and final control (Fig. 149). They are sold as they are, or may be packed (half or small pieces) into plastic bags. All deboned meat pieces may also be sliced and packed under vacuum, in different consumer sizes, as trade demands. The most common use of dry hams and all other uncooked meat products is in the form of very thin slices (Fig. 149), for use in sandwiches or as starters. Bone-in products are used for preparing various cooked dishes. In addition to dry hams, many other uncooked dry processed meat pieces may be manufactured from different primal cuts of pork carcasses and other species (Fig. 150). All parts of a pork carcass may be used (ham, shoulder, loin, neck, back fat, jowl, head, tongue, ears, spare-rib, shank, feet, tail, bones etc.). A long shelf-life is achieved by a combination of long drycuring (more than two weeks) and long cold-smoking, with simultaneous drying and ripening. 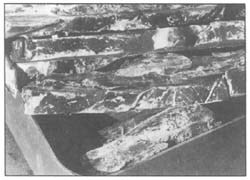 Dry-curing is always followed by repeated salt rubbing during weekly rearranging of meat pieces. Duration of salting or curing depends on size and on the coverage of skin or fatty and connective tissues. All uncooked processed meat pieces must have: a regular shape without unnecessary cuts and rough spots; dry, clean surfaces; moderate cured salty taste and agreeable bouquet; and a water content in finished product not exceeding 30 percent. If the product has skin, it should be clean, light to dark gold-brownish colour, without bristles. “Country pork shoulder” is processed in a similar way to raw dry hams, though with a shorter production time. 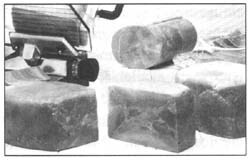 The combined period for curing and salt equalization should be at least 25 days, and the total production time at least 50 days. Dry neck can be made with or without the bones. If bone-in it is cut along the neck bones and first three vertebrae and the upper parts of the first three ribs (3 cm in length). Both types are dry-cured for a minimum of three weeks. Well-cured deboned necks can be filled firmly into fibrous casing or elastic nets. The thicker part must be tied and hung on a stick, and left dripping for five to six hours. When the surfaces are dry enough, coldsmoking can start and should last three to four weeks. Dry loin can also be made with or without the bones. In both cases it must be cut between the third back bone and last lumbar vertebrae, with the corresponding ribs to a width of 3 cm. The external layer of fatty tissue must not exceed 0.5 mm. If all muscles except the long back muscle are trimmed off it is called “dry real loin”. Dry spare-ribs are the cured, smoked and dried lower half of the ribs, with muscles between them. Dry head is the cured, smoked and dried half head of all kinds of small animal, totally deboned, without salivary and lymphatic glands and tonsils. Dry shanks and feet are well-cleaned, singed, cured, smoked and dried sheep, goat, deer and pig feet. Dry tail, usually cut off together with the aitch bone, is a cured, smoked and dried product. Sheep, goat or small venison pastrami are cured, smoked and dried carcasses or sides, without the head and neck, either bone-in or partially deboned. In the first case, for better salt penetration, the largest muscles must be incised, the joints opened in the interior part, and the long bones broken longitudinally. In partially deboned products, all bones except the vertabrae are removed. 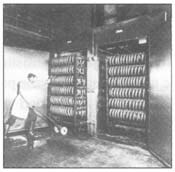 In both cases, dry-curing agents are rubbed in and the carcasses or sides are spread in wide vats, to prevent creasing. Curing lasts from three to four weeks, depending on the thickness. During that time the product is recured twice, with repeated rubbing. 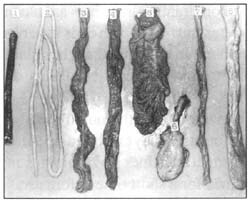 After curing it must be flushed, tied with many loops and hung on a stick for stretching by placing two rods longitudinally in the shoulder and ham. Smoking lasts for at least a month to give a desirable gold-brownish colour and an attractive flavour. Beef pastrami is dry-cured and smoked beef navel part or well-trimmed brisket. The raw material must be rubbed on both sides with a mix of nitrite salt and saltpeter and left in curing vats for two weeks. After seven days, the product must be repacked and, if necessary, some parts rubbed again. After curing residual salt is eliminated by washing and the product is hung for dripping. Smoking starts when the surfaces are dry enough, at 54°C, with light smoke, for three hours. The amount of smoke and the temperature are gradually raised until the inside temperature of 74°C is reached. The product is then removed from the smokehouse and hung at room temperature for a minimum of two hours before being placed in the cooler prior to sale. The majority of this type of processed meat is fabricated from pork, but there are also certain cured and cooked beef products. Cooked hams are made either from entire hams (pork leg muscles, with or without shank) or reconstituted from leg muscles or parts of them. As a rule, hams are produced as boneless, skinless, shankless and defatted products. Most often, they are packed in a can or plastic pouch sealed under vacuum. 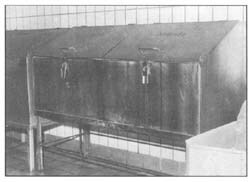 In both cases, pasteurization (cooking at temperature lower than 100°C) is done in the final container in which they remain until slicing (Fig. 156). Being perishable they must be kept under refrigeration. The exception is with small packages (lighter than 1.4 kg) of hams which can be produced as commercially sterile products. Beef hams are made from meat from younger cattle and the same process is applied as for the manufacture of cooked hams. Additives. Water, salt, sugar, phosphate, nitrite and sometimes salts of ascorbic acid and soy isolates are the basic ingredients of curing brine. The amount injected depends on product quality. Water used for preparing curing brine must meet the standards of potable water. All ingredients should be well chilled. Data presented in Tables 10 and 11 show that injecting 12, 31 or 36 percent curing brine of appropriate composition will give the desirable amount of salt (2.6 percent) and nitrites (0.016 percent) in the finished product. The amount of other additives may vary with local regulations. Brine injection. For small production one-needle brine injectors are sufficient (Fig. 151). The modern method uses pickle injectors with a large number of needles, providing a more even distribution of the curing brine (Fig. 152). Pressure during injection can be regulated, as well as the speed of the conveyor providing the material. These multi-needle injectors allow more brine to be injected into products than the traditional method. The pressure of injection varies from 1 to 2 atm, depending on the number of needles used and the amount of brine to be injected. For high brine injection rates (20 percent or more) it is better to inject twice under low pressure than once under high pressure, to avoid the formation of “lakes” of brine in the muscles. The weight of meat must be checked before and after injecting. If the percentage of injected brine is less than that required, it can be made up by adding it in the massaging vat. Mechanical treatment of meat after brine injection has become a recommended process for larger-scale production, not only for cured entire meat pieces but also in the production of reconstituted smaller pieces. During mechanical treatment, muscular cells are ruptured so that myofibrilar proteins quickly come in contact with the brine and swell. Exudate which consists of cell juices, brine, meat particles and salt-soluble proteins acts like a “glue” to bind meat pieces together. Processed ham can therefore be easily sliced without falling apart. The advantages of mechanical treatment are shorter curing time, better yield, less cooking loss, improved tenderness and better sliceability. Duration of the mechanical treatment depends on the machine and usually lasts from nine to 24 hours at 2–4° C.
Tumblers are containers in the form of a cylinder rotating around the axis. The speed of rotation is 10–20 revolutions per minute (rpm) and the total number of revolutions should be 4 000–8 000, depending on the size of meat pieces and machine size. As a rule, tumbling lasts for about 18 hours, with five-to ten-minute tumbling intervals followed by 20- to 25-minute pauses. Tumbling under vacuum is recommended to avoid foaming and to improve colour stability. 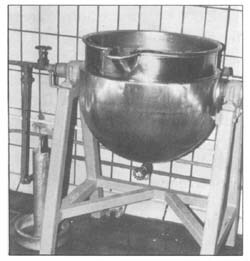 Massaging vats have handles placed horizontally on the vertical axis propelled by the electrical engine which squeeze the larger pieces of meat (Fig. 153). The duration of massaging, time intervals and total time are similar to tumbling. The use of a vacuum is not possible with these machines. Heat treatment (pasteurization) of the product in plastic pouches, cans or ham boilers, is done either in an autoclave or a cooking vat in water at 80-85°C (Fig. 154). Cooking lasts until the temperature at the geometrical centre (the coldest point of the product) reaches 70–75°C. Containers are cooled under running water until the temperature in the centre of the product falls to 35°C, when they are moved into coolers at 2–4° C.
Improper trimming of connective tissue which contracts during thermal treatment resulting in an uneven surface and holes in the cross-section. Bad sliceability of hams (pieces fall apart) is the result of insufficient mechanical treatment and/or insufficient exudate (Fig. 155). Holes in the cross-section result from insufficient vacuum used during can stuffing. Uneven colour of slices due to incomplete trimming of PSE muscles whose pale colour persists to the finished product. 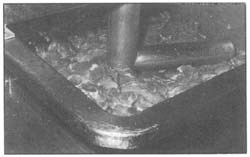 Excessive cooked-out juice results from incorrect brine composition (insufficient salt or phosphate) or improper mechanical or heat treatment. Overcooking beyond the temperature required for pasteurization increases the amount of cooked-out juices, and gives the product surface a softer consistency. Undercooking due to insufficient heat treatment is the greatest and most serious fault. The most important consequences are shorter shelf-life and/or rapid spoilage. Less important are harder consistency and uneven colour of slices. Storage and shelf-life. Canned cooked hams should be kept at 5°C to give a shelf-life of six months. Thin slices of ham are used for sandwiches or as starters. Smaller slices are used for ham and eggs (Fig. 156). Other products such as canned cured shoulders, loins, necks, etc. are manufactured in a similar way. Comminution is the mechanical process of reducing raw materials to small particles. 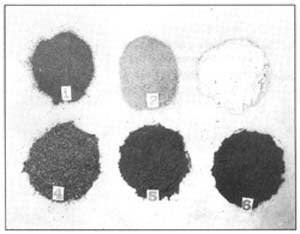 The degree of comminution differs among various processed products and is often a unique characteristic of a particular product ranging from very coarsely comminuted, to finely comminuted, to form an emulsion. Machines for comminuting. The range and quality of finished products prepared from comminuted meat depend on the skill of personnel and the equipment available. A minimum layout should include grinder, cutter, emulsion mill and ice-maker. Machines must be designed for easy cleaning. All surfaces in contact with products must be smooth, free from pits, crevices and scales. Machines must be constructed either of stainless steel, or heat-resistent, non-toxic plastic material. All machines and tools must be carefully cleaned several times during the working day and disinfected at the end of the day. Manufacturer's instructions about the use and the maintenance of the machines must be strictly followed. The grinder is usually the first machine used in the comminution of sausages. 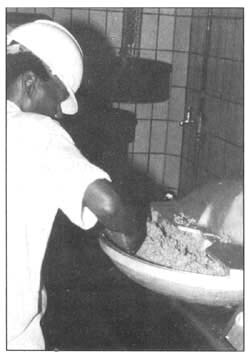 For non-emulsion-type sausages, grinding is often the only form of comminution. It is used to cut the raw material and thoroughly mix the ingredients. Meat is pushed along a worm-screw and then through perforated plates. 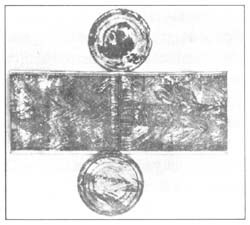 The holes of the grinder plates vary both in size (2–30 mm) and shape (Fig. 157). If the plates and knives are not kept in good condition, and particularly if they are not sharp, meat will be overheated, become greasy and lose its binding ability. The cutter is the most important comminuting machine, for simultaneous comminution and mixing. 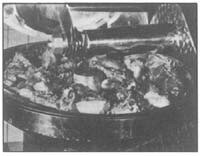 Meat revolves in a bowl and passes through a set of knives mounted on a high-speed rotating arbor in a fixed position. The meat is guided toward the knives by a plough fixed inside the bowl. There are usually two speeds each for the bowl and the knives. The knives can differ in size and shape from rectangular to round. There can also be a special device for charging and discharging the bowl. To eliminate heating of the batter caused by friction, ice water is added. This is better than ice flakes alone. To avoid excessive heating, properly sharpened knives must be used and the clearance between the knives and the bowl should not exceed 0.7 mm. A thermometer is mounted on the cover of the bowl to monitor the temperature of the meat batter. Modern cutters can operate under vacuum, which improves the colour and other properties of the finished meat products. Depending on the meat-particle size desired, it is possible to produce a satisfactory comminuted meat product using only the cutter. 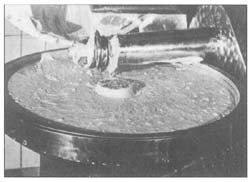 For very fine products, such as frankfurter or bologna, it is often preferable to pass the emulsion obtained in the cutter through an emulsion mill. 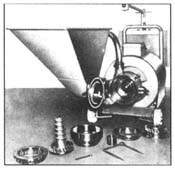 The emulsion mill (Fig. 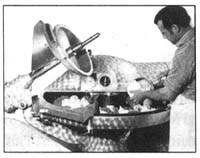 168) is operated by one or more rotating knives, revolving at extremely high revolutions, pulling the sausage mixture through one or more plates. Emulsion temperature rises by up to 3°C on each pass through the emulsion mill. The ice-maker freezes water on the spot into ice flakes. Tools. There are many tools used in meat comminution (Fig. 158). Trays, metallic or plastic, are used to keep, transport and weigh small quantities of the various raw materials and for washing dismantled parts of machines. Vats, metallic or plastic, are used to hold larger quantities of raw materials (up to 200 1). 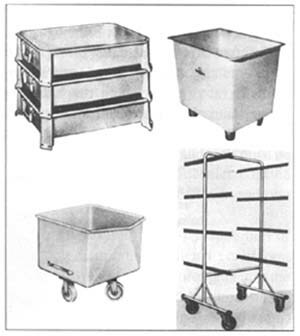 Container trolleys are movable containers used to keep and transport raw materials from the cooler to the workshop, or between machines. Filling tables are metallic tables upon which the filled sausages run from the filler. They are made with raised rims, except under the filler. Sticks are wooden or preferably metallic equipment for hanging up linked sausages (individually or in links), or meat pieces, for dripping, smoking, heat processing and storage. 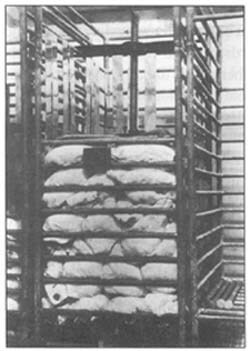 Cages are metallic structures in which loaded sticks are transported for further processing (smoking and heat processing). Balance and scales (Fig. 142) are used for weighing various raw materials, salt, curing agents and all additives. They are also used for checking product weight before and after each stage of processing to control weight loss. Thermometers are used to check product temperature during comminution. Comminution is a procedure which modifies the properties of fresh meat, so that the finished product consists of small meat and fatty pieces, or it can be finely subdivided to obtain a meat batter. This meat batter is a viscous mass, with many properties of an emulsion. A major problem in manufacturing emulsion-type sausages is the tendency of fat to be separated during heat treatment. 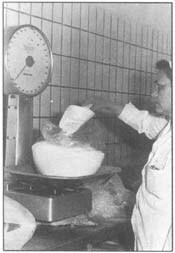 The sausage batter, at least in part, is formed of a “fat/water emulsion” (meat emulsion or, better to say, dispersion), employing salt-soluble proteins of meat as emulsifying agents. Comminution, the basic method for sausage making can be: coarse, to produce non-emulsified sausages like salamis and summer sausages, or fine, to produce emulsified sausages like frankfurters, bologna, etc. (Fig. 159). 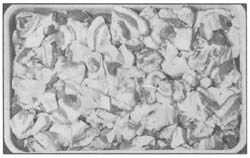 Coarse comminution is used to manufacture sausages with a coarse texture with small pieces of meat and fatty tissues visible. For Meat I and for Meat II a 15- to 25-mm grinder plate is used while trimmings and fatty tissues are passed through a 2- to 6-mm plate so that the connective tissues are less visible and more digestible. Meat I and Meat II are passed through the grinder first, followed by the trimmings and finally the fatty tissues. This avoids fat separated from the fatty tissues greasing the surface of meat pieces thereby decreasing their binding ability. The meat should be well refrigerated (2–3°C) and firm, so that it will be cut cleanly by the grinder knives and not squeezed. Correctly pre-ground meat is transferred into the mixer or mixed manually for formulation. Nitrite salt and phosphate are added and the mixing starts. All other non-meat components are added during mixing, finishing with ascorbic acid. When the mixture is uniform the sausage mixture is formed. 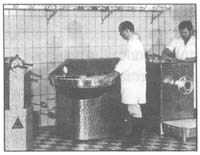 Fine comminution used to manufacture emulsion-type sausages is performed in a high-speed cutter (Figs 160, 161, 162, 163 and 164). The knives must be kept thoroughly sharpened and properly adjusted to the bowl. During comminution bundles of fibres, myofibrils and filaments are separated and disrupted and the size of meat and fatty tissues is continuously reduced. The muscle tissue, having a stronger structure than fatty tissue, determines the total comminution time required. Heat produced during comminution helps the salt-soluble proteins to concentrate at the fatglobule surface and come in contact with water from the protein matrix. Higher speeds produce a better distribution of fat due to the temperature rise but excessive temperatures (more than 15°C in pork and 18°C in beef) can partially destroy the protein membrane which surrounds fat particles, and cause a breakdown of the sausage mixture. Unprotected melted fat migrates to the surface, forming easily visible fat pockets between the sausage surface and the casings. The melting point of fat is the parameter for determining the maximum temperature for the meat batter. Overcomminution can also provoke breakdown. As the fat particle size continuously decreases, there is a proportional increase in the total surface of fat particles requiring proteins. Generally, as particle size decreases more meat and meat-extender proteins are required to form a heat-stable emulsion. Frozen and chilled meat for different products. Frozen meat must be sliced in a frozen-meat slicer prior to grinding. The block of meat (Fig. 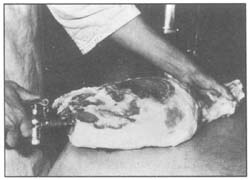 165) is placed upon the carriage and passed under a large knife which cuts the meat into large slices (Fig. 166) or smaller meat flakes. Frozen meat is not suitable for coarse comminuted sausages but may be used in manufacturing fine comminuted meat products. So that the optimal temperature (3–5°C) for extraction of salt-soluble proteins is reached, only water without ice is added in the cutter. Some meat extender must be added to bind juices from the frozen meat which will be separated during heat treatment. Chilled meat is more suitable for both coarse and fine sausages as the meat batter can be more readily maintained at the optimal temperature. Another advantage is that neither a frozen-meat storage facility (minimum -18°C) nor a frozen-meat slicer is necessary. Methods of addition of salt, additives and spices. The aim of using salt and/or nitrite salt in manufacturing comminuted meat is to separate the maximum quantity of salt-soluble proteins from the muscle cells. Optimum salt concentration for total extraction is 5–6 percent, and the optimum temperature is 3–5°C. Salt must be sprinkled on the pre-ground meat in the bowl as soon as possible. By mixing meat and salt at the slowest speed, salt starts to extract proteins from broken muscle cells. Half the ice water (1:1) is added to speed this process and control the temperature rise. Additives contribute to improving and intensifying some properties of meat proteins, especially water-holding, water-binding and emulsifying capacities. In order to achieve this they are sprinkled on the meat after the salt has completed its effects, but always before adding fatty tissues. To achieve uniformly and well-flavoured comminuted meat products, spices must be properly sprinkled in the meat batter and are added after additives, but always before fatty tissue to avoid them sticking to it causing a non-uniform colour. All spices for sausage formulation should be weighed and mixed in a plastic bag before adding to the meat batter. Hygienic aspects of comminuted meat. 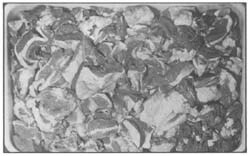 Comminuted meat is more highly perishable owing to the large surface area exposed to many sources of contamination, the availability of the meat juice, water and nutrients, and the distribution of surface flora during comminution. The flora count varies greatly, presumably reflecting the initial contamination. For example, the count in ground beef is usually less than in minced pork. High counts will arise during comminution if the temperature of the sausage mixture is not properly controlled. It may however be preserved in different ways: adding salt and nitrite, smoking, heat treatment, and adequate storage. The preservative effect of salt is due to its capacity to lower water activity to a level that inhibits bacterial growth. For a longer shelf-life other preservative methods must be used such as the addition of nitrite which has a marked bacteriostatic effect. If the sausage mixture is kept at a relatively high temperature (above 20°C) before it is filled into casings, vegetative bacteria will grow and cause deterioration. In order to kill most micro-organisms present, emulsion-type sausages must be heat-treated to an internal temperature of 72–75°C. The product shelf-life is thereby significantly extended. The product must be quickly chilled after heat treatment, in order to prevent growth of any surviving flora. After the final inspection it is ready for sale. Finished products must not come into contact with the floor (Fig. 167) or any other contaminated materials, especially raw meat or natural casings. The basic objective of meat comminution is to manufacture sausages of standard quality with a desirable hygienic level, and an acceptable shelf-life. For this reason, during comminution all improper handling which can promote growth of micro-organisms must be eliminated. The meat products are not only highly perishable, but may also become the source of foodborne diseases. Unclean machines. Meat batter and sausage mixture represent very good nutritive media for rapid growth of micro-organisms, owing to the presence of the soluble nutrients. If any interruption in production is greater than half an hour the machine must be emptied, the sausage mixture placed in the cooler, and the machine immediately washed. Failure to do so will lead to heavy contamination of the next batch. The contamination will be even more serious if residual material stays in unclean machines overnight or even during the weekend. To eliminate these hazards the machine must be washed immediately after use with hot water. The best method of washing for machines, containers and walls and floors is with a special cleaning machine. When attached to the water supply the machine can increase the water pressure tenfold to make cleaning very effective. Liquid disinfectant may also be added. Hot water (minimum 83°C) gives the best results. 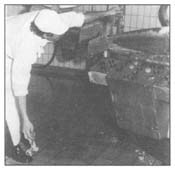 During dismantling of any machine, either for daily washing or routine control of cleanliness, dismantled pieces must not be placed on the floor (Fig. 168). They should be put in a plastic (not metallic) tray or vat and after washing hung on a rack, for draining overnight. The next day their cleanliness and sharpness must be checked before use. Water remaining after cleaning must be eliminated before leaving the workshop (Fig. 169). Unhygienic handling. There are many manual operations in a nonautomated production line for comminuted sausages. Unhygienic handling can provoke rapid bacterial growth, which will persist even after hightemperature heat treatment, resulting in a shorter shelf-life. Meat trays, other tools, plastic aprons etc. must never be washed on the floor (Fig. 170). Any material falling on the floor must not be reused in further processing (Fig. 171). All dirty and contaminated material must be placed in a special watertight non-corrosive bucket, with a lid fastener, to prevent access to unauthorized persons and clearly marked in large red letters “condemned”. Meat extenders are usually protein additives, defined as non-meat proteins. A wide variety of meat extenders are available for use in emulsion-type sausages to improve consistency and emulsifying and water-binding capacities. They can also serve to enhance protein content, improve processing yields and reduce formulation costs. The most important meat extenders are soy proteins, milk proteins, starch, flours and yeast. The permitted maximum amount of meat extenders in sausage production is usually 3.5 percent and is strictly regulated by law in certain countries. These are table proteins from soybeans in the form of flours, grits, concentrates and isolates, texturized, untexturized and extruded. 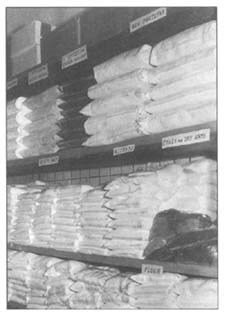 Soy flour is a screened, graded product, obtained after extracting most of the oil from dehulled soybeans. Soy grits are particles of larger size, described as coarse, medium and fine. Soy flours and grits may be defatted, low-fat, or high-fat. Owing to their functional properties (emulsion stabilization, and fat- and juice-binding), soybean flour and grits are used in the production of all emulsion-type sausages, meat patties and canned-meat products. However, both flour and grits give a slightly bitter taste to meat products, which limits their use (up to 2 percent). Soy protein concentrates are high-protein products (not less than 70 percent). They possess good water-absorption abilities and are used in emulsion-type sausages, luncheon loaves and meat patties (2.5–3 percent). Soy protein isolates are the most refined form of soy proteins, without water-soluble sugars and other insoluble components. Owing to their highprotein content (minimum 97 percent) they have excellent dispersing, emulsifying, gelling and water-and fat-binding properties. They are used in production of bologna, miscellaneous sausages, canned and dietary meat products. Textured soy proteins are available in a variety of shapes, sizes, flavours (beef, pork, ham, chicken etc. ), textures and colours. They are used as extenders in comminuted sausages, meat patties and canned-meat products. Some physical properties and typical chemical composition of different soy protein products are given in Table 12. Soy proteins and meat proteins interact differently with salt. While salt aids the extraction of salt-soluble proteins from meat, it has the opposite effect on soy proteins since it prevents their hydration. It is important therefore to add meat, soy proteins and salt in the correct order. Salt should be added only after hydration of soy proteins has been completed. For complete hydration sufficient water must be available and enough time allowed. The soy product/water ratio should be 1:4 or 1:5, with a minimum of three minutes' chopping with the knives and cutter at the highest speed. Soy proteins may be used in sausage production in dry gel and emulsion forms. Dry form. Meat is placed in the bowl at slow speed and soy product is added. The correct amount of water is added at the highest speed to allow complete hydration of the soy proteins. When the mix is homogenous, phosphate is added and finally nitrite salt. Gel. Using soy gel ensures that the soy proteins are completely hydrated. To 15 kg of dry soy product, 60 kg of water is added. Complete hydration can be seen by the appearance of the gel consistency. Such gel, if used in sausage production, must be added to meat batter before fatty tissues and other additives. The remaining gel is stored in a cooler and, if not required until the next day, 2 percent salt is added. Emulsion. Soy products can be added to emulsion-type sausages in the form of a pre-processed soy emulsion. These can be produced by processing with cold or hot water, depending on whether fatty tissues are used. The ratio between soy product, fatty tissues and water is 1:5:5 for firm and 1:4:4 for soft fatty tissues. In both cases, soy product is placed in a bowl, water is added, and the mix is comminuted to complete hydration (minimum three minutes). Fatty tissue is added and chopping is continued at the highest speed. For better bacterial stability 2 percent salt must be added. 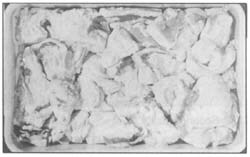 Coldprocessed emulsion can be used the same day, but hot-processed emulsion must be chilled overnight in flat trays in layers not more than 10 cm thick. These are casein, lactalbumin, lactoglobulin and other serum proteins. Casein is one of the most important proteins, used as an emulsifying agent in sausage manufacturing as caseinate (dry milk-protein isolate). It is a fine white powder with neutral taste and a protein content of approximately 94 percent. Unlike the coagulable soy proteins, egg albumen and blood plasma, milk protein does not coagulate, shrink or form a gel while heating. If caseinate is added to meat before salt addition, it will surround free fat particles during comminution. Thus, the binding capacity of meat saltsoluble proteins may be enhanced to form a more stable emulsion. Prefabricated caseinate emulsion. When making this emulsion, the order of addition, the necessary emulsifying time and temperature, and the protein:fat:water ratio are of major importance. After the fatty tissue has been comminuted to a fine paste, dry caseinate must be added immediately, followed by all the hot water. After four to six minutes of comminution the emulsion is ready. During the last few rotations 1.5 percent salt is added. For high-emulsion stability it is necessary to reach a minimum emulsifying temperature of 45°C for pork and 50°C for beef fatty tissues. The emulsion must be chilled overnight in flat trays. Next day the emulsion may be added to the meat batter, together with fatty tissues. The usual caseinate:fat:water ratio for the lower-viscosity caseinate (EM-6) is 1:5:5 and for high viscosity (HV) is 1:8:8. If cooked pork skin is used, the ratio of caseinate:fat:water and skin is 1:8:8:2 for sausages. Dry powder caseinate may be used when prefabricated emulsion or gel are unavailable. 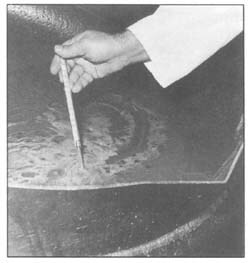 As this is absorbed at the fat-water interface it is absolutely necessary to add caseinate before fatty tissues to ensure that the emulsion is heat stable. Prefabricated gel is a concentrated solution of caseinate in water. Optimum results can only be expected when the caseinate is completely dissolved in water (1:8). It is recommended to moisten caseinate in the cutter with an equal amount of ice (1:1). After a few minutes of comminution the remaining seven parts of water are added. The gel is used in sausage formulations containing relatively small quantities of fat and in coarse comminuted sausages. This is a complex sugar of plant origin. The basic technological function of starch is to absorb released water and juice during heat treatment. The most frequently used starches are wheat, maize, potato, rice and manioc. Starch is used in doses up to 4 percent. During heat treatment of sausages, added starch binds part of the free water and swells, thus decreasing weight losses. Wheat flour is the most commonly used binder following hydration. Approximate chemical composition is starch 65–75 percent, gluten 8–14 percent, and water 12–16 percent. If flour is added in sausage formulation, care must be taken to prevent quick decomposition of the sausage mixture. Owing to the activity of flour enzymes, flour is commonly used in lowquality sausages (up to 4 percent). Brewer's inactivated yeast with the bitter taste removed is frequently used. It is a fine yellow-grey or grey-pink powder, with distinctive taste and smell. Approximate chemical composition of yeast is: 53 percent proteins, 36 percent sugars and 3 percent water. In the meat industry the most important application of yeast is based on the ability of its proteins to emulsify fat. A heat-stable emulsion is obtained if the yeast, water and fat ratio is not more than 1:5:5. In comparison with soy isolate and caseinate, yeast proteins have a lower ability to emulsify tallow. 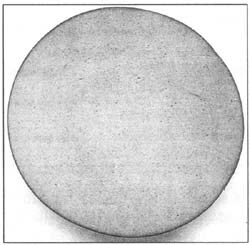 A heat-stable emulsion with tallow is only obtained with a ratio of 1:1.3:1.3. Yeast can be used as an emulsifier in cooked and in canned chopped meat products and can easily replace caseinate in paste production. Yeast used in these products may improve their flavour. The content of free amino-acids improves the flavour of the meat product. Yeast also intensifies the flavour of certain seasonings, especially those with hot components. This is obtained from special yeasts cultivated on cane-sugar nutrient media. It contains many proteins, amino-acids and B-complex vitamins. It is used for improving the flavour of canned meat. 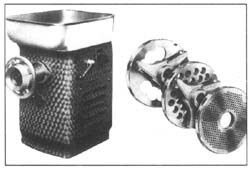 Casings are special cylindrical containers used to protect sausages and various meat products. 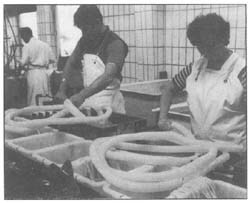 Since sausages are comminuted products they must be placed in some type of forming device to give them shape, to hold them together during further processing and for protection. Casings may be natural or artificial. These are derived almost exclusively from the gastro-intestinal tracts of swine, cattle, sheep, goats and horses. Hog casings are prepared from stomach, small intestine (smalls), large intestine (middles) and terminal end (colon) of the large intestine (bung). Beef casings may be from the oesophagus (weasands), small intestine (rounds), large intestine (middles), bung and bladder (Fig. 172). The intestines of sheep and goats are used to produce casings primarily for fresh sausages, frankfurters, hot dogs etc. Natural casings can be classified as narrow, medium and wide. Treatment and storage. Intestines intended for use as casings for sausages must be immediately processed after evisceration. First they are emptied and well flushed. Pig, sheep and goat small intestines are scraped thoroughly without inversion to remove the exterior (serous) and interior parts (mucous membrane), preserving the middle elastic muscle (Fig. 173). The same method is applied to the large intestines of all animals. Well-scraped, flushed and drained intestines are well sprinkled with common salt (dry salting) or saturated salt solution (wet salting), spun and tied into intestine completes. They are arranged into plastic casks. The top of the intestines is pressed down and salted again in order to eliminate air contact. These casks must be firmly closed and stored in a dark cooler. If intestines are prepared for long storage (more than three months), they must be salted with a mixture of salt and 0.2 percent antioxidant. Large intestines and bladders can be preserved by means of air-drying. In this case, after scraping, flushing and a short draining intestines are blown up in order to eliminate the remaining water and tied at both ends in hanks, for quicker air-drying. They should be hung in a sunny, draughty place. When well dried they are sorted according to diameter and packed. Such dry casings do not require storage in a cooler. Application. All salted natural casings should be thoroughly flushed inside with running water the morning before use. They are then dipped into warm water to regenerate their elasticity (small intestines 10–20 minutes and large intestines 30–60 minutes) and drained for a short time before use. The advantages of these are uniform cylindrical shape, a range of specific diameters, suitable tensile strength, resistance to damage, ease of use, variety of sizes and low microbial level. They can be filled uniformly and linked either by hand or machine into regular lengths. 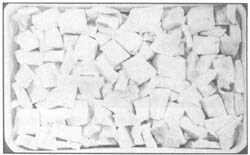 Cellulose casings are prepared from cotton linters in sizes ranging from 1.5 to 15 cm. They are easy to handle and fill, possess a high degree of resistance and are permeable to smoke when moist. The degree of permeability decreases as the casing dries during processing. Small cellulose casings are used for skinless frankfurters or wieners, skinless smoked link sausages and many other small sausage products (cocktail sausages). Small cellulose casings are also available in shirred form. 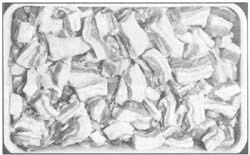 Large cellulose casings are available in three types: regular, highstretched and large. They are used in making all types of sausages and smoked meat. Cellulose casings are inedible and must be removed before consumption. Inedible and edible collagen casings are regenerated from collagen extracted from skins and hides. The inedible collagen casings combine some of the advantages of both natural and artificial casings, especially their strength, uniformity and shrink characteristics. They must be removed prior to consumption. Edible collagen casings are mostly used for fresh pork sausages and frankfurters. Synthetic casings and bags are impermeable to smoke and moisture. They are used with unsmoked products such as liver sausages or products which are heat-processed in water or a retort. Artificial casings are delivered either tied at one end with loops prepared in the factory or in hanks. 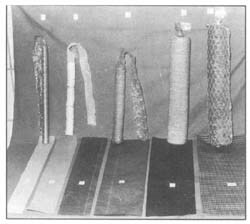 As casings in hanks can be easily stored and their length and the method of tying can be chosen at will, they are well suited to small-scale production. One end of the casing is submerged in cold water (one to two minutes), then tied either in a “doll” or “bow” knot (Figs 175 and 176). To make a “doll” knot, place a string on the casing and twist around, slip the thumb and forefinger on the string 1 cm toward the end of the casing, pass the string through the bight and set the knot, tighten the string, and prepare the loop and tighten with a double knot. When tying a “bow” knot, casings need not be submerged except the end of every dry casing. The method is to place string on casing and tighten by means of a simple knot, fan-shape casing end with knot in the middle, and tie knot underneath the wing (the tied casing has no loop). This method of tying prevents slipping off. Hamburger-type products are made form minced meat and fatty tissue to which salt and seasonings are added. Soy is a common additive but curing agents need not be used. Well-chilled Meat I and Meat II and fatty trimmings are the basic raw materials. All beef, all mutton, all pork or combinations of different meat and fatty tissues in various proportions may be used. Extruded soy proteins (ESP) are often used in manufacturing hamburgertype products. They should be hydrated in water (70°C for 35–40 minutes) in the ratio of ESP to water of 1:1, 1:2 or 1:3. Salt, seasonings and dry or fresh onions are the other basic ingredients. If these products are intended for long-term storage some antioxidants may be added. 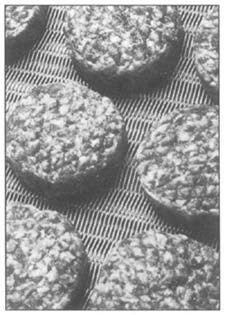 Selected meat is minced through a 5-mm, fatty trimmings through a 3-mm, and hydrated ESP through a 3-mm plate. After mincing, the components are mixed with the additives and seasonings until all components are evenly blended. The mixed batter is then ready for forming and shaping. Weight and shape can vary but patties are usually round, weighing 80–120 g and 5–10 mm thick. 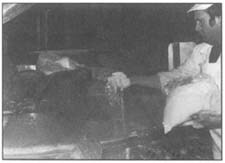 After freezing, the hamburgers are packed into suitable plastic bags or cardboard boxes, and immediately transported to a storage room (Fig. 177). Beef II or Pork II are used with lower-quality products and ESP is hydrated with more water (1:2, 1:3). Hamburger-type products should contain 10 to 25 percent fat but if hydrated ESP is used up to 30 percent may be added. Hamburger-type products are stored at -20°C to give a shelf-life of 90 days. They may be cooked without thawing by grilling, frying in deep fat or toasting on a hot plate. Dry sausages are specific coarse-comminuted meat products whose successful manufacture depends upon bacterial fermentation. At some stages of processing, usually during smoking, these sausages are deliberately held at temperatures which encourage bacterial growth and fermentation. Dried sausages should never exceed 30°C at any stage as this would stop growth. The useful organisms responsible for desirable fermentation (lactic acid-producing bacteria) originate from the natural flora of the meat, processing equipment and the plant environment. Fermentation causes a characteristic tangy flavour to develop, resulting from the accumulation of lactic acid and many other fermentation compounds. The pH usually falls to 4.8–5.4. Another basic processing preservative step is dehydration achieved by keeping the product under controlled temperature and air humidity (drying and ripening). One of the distinctive features of dry sausages is that they are processed uncooked. The low pH (high acidity), low-water content and high-salt content extend their shelf-life. Some but not all dry sausages are smoked. The best known are dry pork sausages, dry beef sausages, mixed dry sausages, summer sausages and salamis. In general, dry sausages are composed of two-thirds meat and one-third fatty tissues to which curing agents and spices are added. Meat I and Meat II (Figs 129 and 130) of all species of slaughter animals can be used, including camel, donkey and horse meat, but rarely mutton, goat or venison. Trimmings are not used owing to their softness, neither are shanks or head or boar meat. Pork jowl and back fat (Figs 133 and 134), beef external fatty tissues and humps are used as fatty components. Only well-chilled (-1° to 0°C) and/or frozen (-1° to -18°C) meat is used. Frozen meat is thawed for 48 hours on slanting racks to allow the drip to run off. The meat is chopped with sharp regular cuts, without crunching. The temperature of meat and fatty tissues should be adjusted to stay in the range of -2° to 5°C during chopping (Fig. 178) so that temperatures in the filler will be between-1° and -3°C. 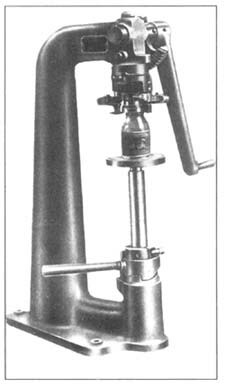 If the temperature in the filler is higher, drops of fat are deposited on the interior walls of the filler horn. During further filling they are pressed into the casing and will grease the interior of the casings lowering their porosity, making smoking, drying and ripening more difficult. Salt (28–37 g per kg) is used to prevent the growth of many undesirable aerobes, favouring the growth of non-spoilage halophile and halotolerant bacteria. Salt also extracts the salt-soluble proteins to form a protein gel which binds the pieces of meat and improves sliceability of the finished product. Curing substances are used in the form of nitrite salt or a dry mix of common salt with 0.6 percent nitrite salt and nitrate (0.3–0.5 g nitrate per kg). Sugars speed acidification and are transformed into lactic acid by certain bacteria. Dextrose is the most commonly used sugar (8–10 g per kg) but can be replaced by saccharose. Spices. White and black pepper (0.5–3 g per kg), ground or crushed, are the most frequently used spices. Fresh crushed garlic, paprika, cardamom, mustard etc. are also used. In some countries wine is added to improve the flavour. Some antioxidative substances may also be added. Starter cultures. To overcome the problems associated with bacterial fermentation, starter cultures of selected lactic acid-producing flora have recently been used. The starter culture provides a predominant flora of the desired bacteria (Micrococcus, Pediococcus cerevisiae etc.) in the sausage mixture, and fermentation is initiated within a minimum time. These may be natural or synthetic. Natural casings are usually small intestine of hog (for small-diameter dry sausages), beef small intestine (for middle-diameter dry sausages), and large hog or beef intestine (for largediameter dry sausages). As for salami (diameter more than 40 mm) and summer sausages the most convenient casings are small horse intestine. The best synthetic casings are the so-called “dry sausage fibrous casings”, as they adhere very well to the product as it shrinks during drying. Like all other sausages there is much variation in the composition of dry sausages and salamis. A common factor is that they do not contain any added cereal, ice or water. In the successful manufacture of many varieties of dry sausages and salami, a great deal of technical skill is indispensable. 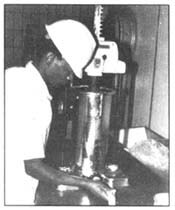 In manufacturing coarsely chopped sausages the grinder and mixer are used but for less coarsely chopped sausages only the cutter is used (Fig. 178). In the first case, meat and fatty tissues pass through the grinder (beef 15-mm, pork 2–6-mm and fatty tissues 8–10-mm plate) and the sausage mixture is made in the mixer. In the second case, chopping and mixing are done in the cutter at slow speed. After adding the curing agents the meat is chopped to the required size then fatty tissues and all other components are added. The mixture is firmer and without residual air if a vacuum is applied. The sausage mixture must be firmly filled into casings. The casings are punctured with small needles over the entire surface to allow entrapped air to escape. 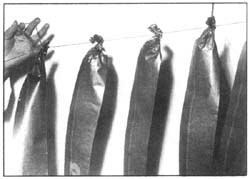 Tied sausages are hung on sticks and transferred into a curing room (Fig. 179). Curing time depends on the sausage diameter, three days for diameters up to 3 cm, and five days for larger. During this period, the cured meat colour is developed and fermentation is initiated. 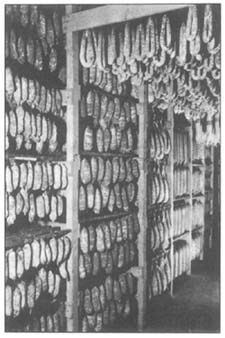 After curing, sausages are transferred to a drying room (Fig. 180). The rate of drying is controlled by keeping the products between narrow limits of both temperature and RH. Too rapid drying will result in the formation of an outer crust on the sausages, which will retard or stop internal drying. If the drying rate is too slow and RH is too high, then surface mould, yeast and bacterial growth are excessive. During drying and ripening, flavour develops, texture changes and the product hardens. Degree of drying can vary according to local preferences. Ripening can either follow or precede cold-smoking, depending on the particular product. Dry sausages must be stored in an environment in which temperature and humidity do not provoke overdrying. They are ready for sale immediately after production. All dry sausages may be sliced and packed under vacuum in different consumer sizes. They are consumed sliced, as starters or in sandwiches. Only complete fulfilment of all technological parameters at all stages of production can guarantee the desired quality of finished products. Dry sausages, like dry hams, are high-quality meat products. The main characteristics of dry sausages are agreeable bouquet, i.e. flavour and taste of a well-matured cured-meat product, attractive colour, good sliceability and long shelf-life. In order to achieve all these, sufficient time must be allowed of at least a month for small-diameter sausages and three to six months for large-diameter sausages and salami. Organoleptic tests and weight-loss control may confirm the end of ripening. Water content of finished dry sausages (of any diameter) should be between 25 and 30 percent. Sausages should not be overdried or they are hard to chew and less acceptable to consumers. They are produced by quick drying without ripening. Depending upon the diameter, this lasts from two to three weeks. 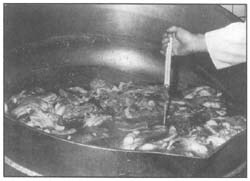 In order to shorten the process, reducing agents (such as Glucono-delta-Lactone) and a starter culture must be added to the meat mixture. Weight loss is lower than in dry sausages, so the water content of the finished product is always greater than 40 percent, resulting in a shorter shelf-life, a sour taste and a poor flavour. Sliceability is also owing to reduced binding of meat and fatty tissues. Semi-dry sausages have a maximum shelf-life of one month at room temperature. Creases or detachment appear in sausages with synthetic casings if the filling dries at a faster rate than the casing. Small creases become larger as drying continues, and overdrying causes detachment of the casing. 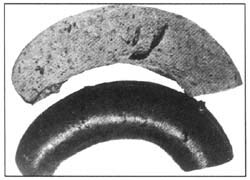 This can be prevented by using more elastic casings and by a slower drying rate (Fig. 181). Crust formation results from rapid drying, especially at the initial stage, and can be detected by careful palpation. If the crust is not firm a preventive measure is to increase the humidity in the drying room to soften and rehydrate the sausage (Fig. 181). Greasy casing results from using soft fatty tissues or from overheating the sausage mixture. Melted fat, under pressure during filling, greases the interior walls of the casing reducing its porosity and preventing normal water migration from inside the sausage. The consequence is a soft sour sausage. If the melted fat penetrates the casing walls, then the product also becomes greasy. Sausage mould, usually greenish in appearance, is the sign of contaminated equipment and workshop. It is eliminated by using good antifungicidal agents in cleaning operations. Sausage sliminess is the result of heavy micro-organism growth on the surface of the sausage casing, encouraged by too high a temperature and air humidity. Partial sliminess can be removed by washing in salty water, followed by dripping and more intensive and dense smoking. This fault may appear when the product is stored in cardboard boxes for a long time. Sour sausage, being invisible, is unfortunately usually detected only at the end of drying during the final control. It has a sour taste, semi-rigid consistency and the periphery is darker than the centre. It is the result of the intensive growth of lacto-acid bacteria, feeding on the added sugar. Preventive measures are to decrease the added sugar and increase the added salt. Such products must be properly dried and ripened. 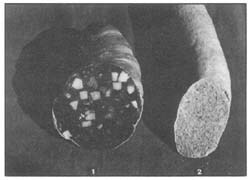 Sausage porosity usually appears in large-diameter sausages. Air in pores causes decomposition of fat, leading to changes in colour and taste (Fig. 182). Poor sliceability is the result of insufficient curing and salting, uneven distribution of curing agents, and/or short curing. The lack of salt-soluble proteins reduces binding between meat and fat particles. Blown-up sausages due to gas produced by sudden micro-organism growth result from contamination of raw materials, equipment, tools and unhygienic production. Dry sausages are a very nutritive meat product which may be eaten immediately after production, without any additional heat treatment. They are sold entire or packed in pieces in plastic bags. All dry sausages can be sliced and packed under vacuum, in various consumer sizes. Dry sausages are usually covered in very thin slices in sandwiches, or eaten as starters. Cooked sausages are fine-comminuted sausages representing an important group of meat products. The basic technological aim is to increase the natural WHC of the meat batter to bind considerable quantities of added water. Cooked sausages may be made of uncooked or cooked raw materials. These are emulsion-type sausages. The finished products are heat-treated to between 75° and 80°C to achieve desirable organoleptic properties and bacterial stability. They are juicy, tasty, easily chewable and digestible. To achieve such juiciness, about 25 percent water is added to the meat during manufacturing. Phosphate must be added to improve the WHC of the meat proteins. Specific amounts of fatty tissues must also be added to achieve the characteristic consistency and flavour. Raw material. Many different kinds and qualities of meat, organs and fatty tissues can be used. Beef, veal and pork are more frequently used, but camel, mutton, goat and venison can also be incorporated. 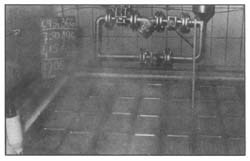 Practical experience has shown that more desirable cooked sausages of the emulsion type are manufactured when hot-boned meat is used. In this case phosphate is not necessary, because hot-boned meat has a high WHC in the first three to four hours after slaughter and can emulsify 22 percent more fat than chilled or frozen. If hot-boned meat is not available only well-chilled and/ or frozen meat should be used. The chemical composition, water-binding and fat-emulsifying properties of the raw materials must be known in order to make products of uniform quality. Suitable raw materials are listed in Table 17. Offals such as heart, tongue, spleen, lungs, stomach, tripe or non-lactating udder are not commonly used in the manufacture of emulsion-type sausages. However, special products of this type may contain smaller quantities of certain offals. Fatty tissues are also important raw materials. They contribute to the palatability, tenderness and juiciness of sausages. Variation in the ability to emulsify fat is due to the amount of soluble proteins potentially available, and their emulsifying capacity. Ice water is used as a carrier for the curing agents, and improves the extraction of meat protein and the hydration of meat-extender proteins. The amount of added ice water depends on the raw material used. Water can be partly substituted by blood plasma which is an additional source of protein and improves the water-binding and emulsifying properties of the product. Regulations for emulsion-type sausages in many countries limit fat content to a maximum of 30 percent and water content to 40–60 percent in finished products. Additives. A variety of additives can be used in addition to meat extenders. Phosphates and seasonings (spices, sweetners, glutamates) may be used to create a range of products. If frozen and chilled meat is used, 0.3–0.5 percent phosphate must be added. Salt and pepper form the basis for a cookedsausage seasoning mixture. All other seasonings are only supplementary to them. Ascorbic acid, sodium ascorbate or sodium erythorbate (about 0.4 g per kg) are used in a 10-percent water solution at the end of the comminution. Casings. Natural or synthetic casings can be used (Table 18) but in both instances they must be firmly filled. Manufacture. The basic aim in cooked-sausage manufacturing is to make a heat-stable meat batter, a meat “emulsion”, consisting mainly of water and protein. Heat treatment transforms it from a viscous form to a rigid and elastic solid structure which can be considered as a protein gel with entrapped fat particles. If the protein gel is strong enough, the fat will not be separated during heat treatment. Principles of mincing. Mincing completely destroys the meat structure. Meat proteins in the presence of salt, phosphates and cold water are dissolved forming a system consisting of a solution of salt-soluble proteins and muscle and connective tissue particles. When fatty tissue is added the fat particles will be emulsified with the salt-soluble proteins during comminution. The proteins will therefore be able to cover the total fat surface, surrounding each fat particle and so stabilize the emulsion. 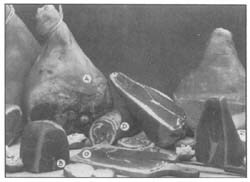 During comminution the structured breakdown of meat and fatty tissues occurs and new systems are formed: minced meat, suspension, after addition of salt, phosphate and ice water and emulsion, after addition of fatty tissues and stable sausage mixture after addition of all other additives (Figs 161, 162, 163 and 164). Principles of filling. Cellulose and collagen casings are ready for transferring directly to the filling horn. Salted, natural casings should be flushed thoroughly prior to use, and filled firmly (Figs 183, 184 and 185). Principles of heat treatment. Proteins show a great tendency to bind to and cross-link with each other upon heating. The binding properties of comminuted sausages originate from the heat-induced gelation of meat proteins. Gelation begins at about 43°C and produces a three-dimensional network structure which stabilizes the fat and water in comminuted meat products and binds meat and fat pieces together (Fig. 186). 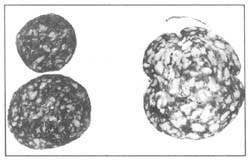 Separation of fat in the form of fat caps or fat pockets (Fig. 187) develops during heat treatment, due to emulsion breakdown, as a result of improper formulation (too much fatty tissue, especially soft or insufficient emulsifier), incorrect order of addition of raw materials and additives, and overcooking. 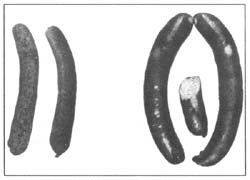 Holes in sausage mixture caused by improper filling (Figs 187 and 188). 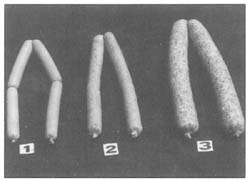 Shrinkage of cooked sausages caused by improper smoking and/or heat treatment (temperature too high and RH too low). Difficult peeling of casings, can be the result of too much connective tissue in the formulation. 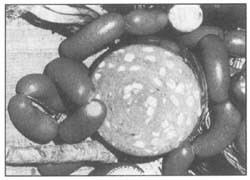 Uneven colour of smoked sausage surface (unsmoked spots) occurs at places where links touch each other. High porosity of sausage mixture due to entrapped air. Different products. The best-known emulsion-type cooked sausages made of uncooked raw materials are frankfurter, Vienna sausage, hot dog, knackwurst, safalada, bologna and veal sausage. Frankfurter-type sausages are sold under many names: frankfurters, wieners (braided in groups of links), Vienna-style sausage (twisted into a chain of links), hot dog, knacker, etc. All these types normally contain more beef than pork (1.5:1). The choice of raw material largely depends on the availability of the meat, the eating habits of the consumers and religious practices. In general, the lean-meat content varies between 25 and 40 percent, the average fat content is 25-30 percent, and 10-30 percent water is added. In low-quality frankfurters, 10 percent of the lean meat can be replaced by pork skin or organs. To maximize yield part of the fatty tissues and part of the water may be pre-emulsified (10–15 percent). If a high-speed cutter is not available, the first manufacturing step is grinding. 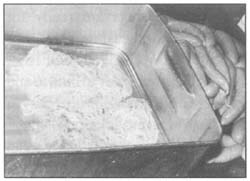 The meat and trimmings must be ground through a 3-mm, and fatty tissue through a 5-mm plate. The temperature of all raw material after grinding should not exceed 3°C. If a high-speed cutter is available, then a grinder is not necessary as the sausage mixture can be made in the cutter. Attention should be paid to the order in which raw materials are added (meat, curing agents, ice water, meat extenders, fatty tissues and seasonings). Water must be added early enough to ensure protein extraction. It is important to control the temperature during comminution, not only for the extraction of salt-soluble proteins but also for the hydration of meat-extender proteins. The final temperature of the sausage mixture should not exceed 18°C if pork fatty tissues are used, and 2°C if beef fatty tissues are used. 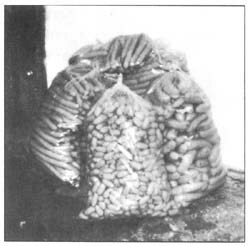 After filling in natural, synthetic, edible or inedible casings and linking, products should be smoked immediately. They are hung on sticks and placed on smokehouse racks (Fig. 186). Links should be separated on the stick so as not to touch each other, otherwise smoking and colour development will not be uniform. Surfaces in contact with the stick or with other links do not dry out sufficiently, favouring the growth of micro-organisms forming slimes, especially in warm conditions. This can be eliminated by shifting the links slightly at some time during smoking to expose the surfaces which have been in contact with the stick. This can be minimized by using “T” profile metal sticks with apertures. Smoking imparts an appetizing flavour and develops a desirable goldbrown smoked colour. 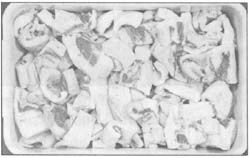 It also contributes to the development of a smooth surface or skin beneath the cellulose casing, that facilitates peeling of the casing prior to packaging. Smoking lasts from one to three hours, depending on desirable colour, temperature and humidity, and type of smokehouse employed. A high smoke concentration and a rather high temperature are desirable during the final period of smoking. Smoking and heat processing start at 54–57°C and the temperature is gradually increased (5.5°C every 15 minutes), until it reaches 82°C. Smoking continues until an internal temperature of 70–75°C is reached. The next step is cold showering until an internal temperature of 32°C maximum is reached. The product is then placed in a cooler. Vienna sausages (Fig. 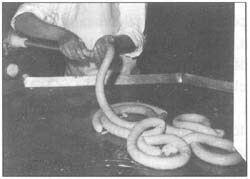 187) are manufactured using beef and pork trimmings with a maximum quantity of water (28–30 percent) and meat extenders, tied in similar lengths to frankfurters (12–14 cm). Hot dogs have the same formulation as Vienna sausages but are tied longer than any other emulsion-type small-diameter cooked sausages (16–18 cm). Safaladas/knackwursts (Fig. 189) have a frankfurter composition but the structure is finer than any other cooked sausage. It is obtained by passing the sausage mixture twice through an emulsion mill, after being manufactured in the cutter. Bologna sausage (Fig. 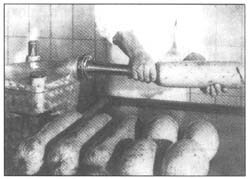 190) is a typical emulsion-type cooked sausage filled into large casings. Curing is as in frankfurters but less water is added. 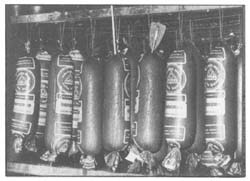 Long bologna is filled into beef middles or weasand, large bologna into beef bungs, and ring bologna into beef rounds. 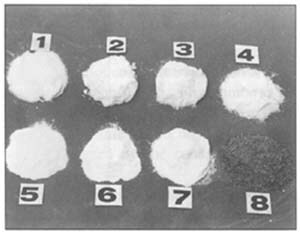 Cellulose casings of corresponding size may also be used. 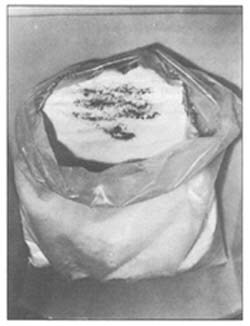 Large bologna must be supported either by wrapping it two or more times with twine and hanging it on a loop in the twine or by supporting it in a stockinette bag. Bologna requires longer smoking (three hours for long and five for large) and cooking than frankfurters. All parts of the bologna must reach 71°C during cooking or the inside of the sausage may become discoloured before it is sold to the consumer. After cooking the bologna is chilled in cold water, superface dried, then placed in a cooler. Shelf-life of cooked sausages is about four to five days, or up to ten days in retail packages (vacuum) held at 10–15°C or as high as 12 to 14 months in cans or jars. Small and medium-diameter cooked sausages (Fig. 189) are reheated before eating in order to regain their firmness and juiciness. Reheating is done in boiling water for about ten minutes (or by toasting or grilling). Cooked sausages are eaten while hot with baked goods (rolls, buns), mustard, horseradish, ketchup etc. Large-diameter sausages are cut into slices (Figs 189 and 190) as a cold starter or used in sandwiches, Russian salads and similar light meals. These are sausages made from edible offal and lower-quality meat and have a specific flavour. The raw materials are precooked, minced, mixed, filled into casings and finally heat-treated. Fine-comminuted sausages are processed in the cutter and coarse-comminuted in the grinder. There are also sausages with a mixture of both fine- and coarse-comminuted pieces of meat, tongue, liver, fatty tissue (all these components are most often cured). Uncooked cured blood (2 percent nitrite salt) is often added and precooked pigskin is also very often used, except with all-beef products in which tendons and other connective tissues are used instead. Raw materials are all edible offals, head meat, lower-quality meat, fatty tissues and pigskin. All components except pigskin are fully cooked. Pigskin is partially cooked until soft enough to be ground in the grinder. Its function is to give the finished product its typical firmness. Precooking is done in boiling water with sufficient water in the cooking vats to cover all the material (Fig. 191). Cooking time depends on the size of pieces. Fully cooked raw materials are comminuted without delay. If comminution is done in the cutter then no blending is necessary (Fig. 192). Additives used are nitrite salt, caseinate, blood-plasma powder, egg white, gelatine and seasonings. All except the seasonings can be added at a rate of up to 2 percent. Casings. Natural and synthetic casings can be used but in countries with a hot climate, if continuous refrigerated storage during retail sale is not possible, priority should be given to synthetic casings (Fig. 193). Such casings are also more convenient because they can be exposed to higher temperatures (up to 115°C retortable sausage) during heat treatment giving a longer shelf-life. cooked sausage with high collagen content. The typical composition of these are given in Table 21. In all formulations meat can be substituted with other edible offal. Liver paste (Fig. 195) is fine-comminuted with high spreadability. Liver sausage (Figs 194 and 195) contains 10–20 percent liver, usually coarse-ground, and other edible offals. Blood sausage (Fig. 194) contains 10–20 percent whole blood with nitrite salt (not precooked). Other components are precooked meat, edible offals, fatty tissue and pigskin. Fatty tissue must be cooked sufficiently in order to separate fat with a low melting point. Components can be coarse- or fine-comminuted as in other precooked sausages. This type of sausage has a firm consistency due to swollen connective tissue components and gelatinized collagen. Cooked sausage with high-collagen content resembles coarse-textured liver sausage but has more connective tissue (collagen and elastic of pigskin and beef tendons). Sometimes up to 10 percent dissolved gelatine solution is used to produce a sausage described as aspic in casing. Heat treatment. The mixture is filled into the casings while still hot and the sausages are immediately heat-treated. Cooking time should be set according to the type (natural or synthetic) and diameter of casing. Natural casings exposed to temperatures higher than 85°C will burst, therefore their shelf-life is shorter (up to ten days at 5°C). Synthetic casings can be cooked in boiling water for about 90 minutes, or even in an autoclave at 110°C for 60 minutes. If they are kept at temperatures below 10°C they will have a shelf-life of one month. Fat separation may occur in the liver paste if insufficient emulsifier is added. The most serious fault is not to fill the casings immediately and not to heat-treat them immediately. In this case the product can spoil even before the heat treatment. Different products. There are many products of this type which differ in the raw materials, grade of comminution and seasonings (Figs 194 and 195). Sometimes cooked rice is added to the sausage mixture. Eating method. Liver paste is spread on bread or is used to make sandwiches. Other types of sausage are cut into slices and consumed cold. The canning process involves two essential operations: the product must be heated at a sufficiently high temperature and for long enough to make it fully or commercially sterile, and it must be sealed in a hermetic container which will prevent recontamination of the product. Commercial sterility differs from total sterility in that some organisms may survive the heat treatment but the conditions which prevail in the container during storage do not allow these to grow, produce toxins or spoil the product. However, in regions having a tropical climate, canners strive for total sterility of their canned products. The need to achieve at least commercial sterility determines the minimum heat process to be applied to a product. There is sometimes a temptation for canners to use less than the recommended minimum heat process. This may result in the product not being commercially sterile. It may then become toxic and poison consumers, or the product may be spoilt and the cans may swell and have to be destroyed. It is essential for people dealing with canning to know what heat processes are required for their products, how these are to be applied, and the nature of the risk they take if less than minimum processes are used. This is why in numerous countries only people having achieved the required level of expertise in canning technology and heat process calculations are authorized to approve heat processes. Commercial sterility is obtained in meat products which belong to lowacid foods (pH higher than 4.6) if the process applied is severe enough to inactivate the spores. Therefore, meat products are usually processed in steam (or water) under pressure at 116–121°C and sometimes in steam at 140°C. The organisms which are capable of spoiling meat products include those which form heat-resistant spores, thus high-temperature processes are needed to make them commercially sterile. Usually heat processes for canned products are designed to inactivate large numbers of spores of the organism Clostridium botulinum. Although these spores are not as resistant as the spores of some other Clostridium and Bacillus types, C. botulinum is capable of producing lethal toxins, sometimes without swelling the container or obvious alteration of the appearance of the product. Since this organism presents a public health risk, recommended heat treatments must have a large safety margin. The severity of heat processes for canned meat products is measured in terms of F0 -values which means that the product received a heat treatment with the same inactivating effect as exposure for one minute at 121°C. For example, one minute at 121°C gives the same amount of inactivation of spores as four minutes at 115°C or 13 minutes at 110°C or 40 minutes at 105°C, so all those processes will have the same F0 -value. F0 -value for the majority of canned meat products ranges between one and ten. Larger canned products require higher F0 -values, even up to 20–25, owing to the longer period needed for heat penetration. Meat products made from chopped cured meat that can be canned include corned beef (consisting of large and small pieces of beef, blanched to give a lower water content); corned mutton (similar product made from mutton); beef hash (similar product made from lower-quality meat to which some edible offal is added); minced beef; luncheon meat (similar to emulsiontype sausage) made from beef, pork, or a mixture of beef and pork, or from other kinds of meat; pressed beef (made from large cured high-quality meat pieces; picnic ham (usually weighing 0.5 kg); canned cured ox tongues. Similar products made from pork are: minced pork, chopped pork, lunch pork, pressed pork, pressed ham and many others. Stewed beef, stewed mutton, stewed veal and stewed venison are frequently canned, as well as dishes in jelly such as veal in jelly. Liver sausage, liver paste and some other pastes and frankfurters in brine are also suited for canning. Container. The container protects the canned product from spoilage by recontamination with micro-organisms, therefore reliable containers and properly adjusted closing machines are essential to prevent access of spoilage organisms during the cooling operation and during the shelf-life of the product. Before filing, containers have to be rinsed or otherwise cleaned from dust or other impurities (Fig. 197). 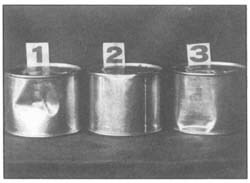 Tin-plate cans are most commonly used, such as the soldered side-seam three-piece can, consisting of can body, can end and lid. The cemented sideseam and welded side-seam cans constitute the majority of cans produced, and remain one of the most reliable and acceptable packages ever conceived. The benefits of using three-piece cans include no size limitations, a wide range of plate thicknesses and tempers for body and ends, abuse resistance, strong end profiles and long shelf-life. Two-piece cans are becoming popular for some applications. Can end and body is drawn in a single piece from flat sheet stock. Only shallow cans (height less than half the diameter) can be fabricated this way. 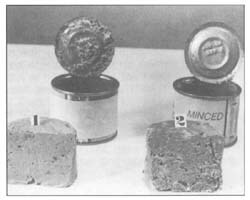 Enamelled cans are more suitable for canned meat products because interior corrosion of cans can be avoided (Figs. 196, 197 and 198). Increasingly more attention is being given to aluminium for manufacturing cans and other containers for canned meat products, where special opening features are desired. Important advantages of aluminium cans are that they are lead-free and do not rust. Most often two-piece aluminium cans are used in meat canning (Fig. 196). Aluminium for can ends and bodies is, without exception, coated with enamel on both sides. It is widely used in flexible and semi-rigid containers as a protective packaging for a large number of meat products. As a result of extensive development, the use of flexible, laminated pouches and formed aluminium containers for shelf-stable sterilized products is a commercial reality. The retortable pouch, a thin rectangular package used for heat-sterilized meat products, offers potential improvements in convenience and quality because of its shape and composition. During heat processing, its shape and size allows rapid heat transfer to destroy micro-organisms at the innermost part of the pouch without excessively overheating the product near the pouch wall. The contents are likewise more rapidly cooled at the end of sterilization. A suitable laminate used to make retortable pouches consists of three foils (polyester, aluminium and polypropylene film or resin). These containers are heat-sealed. Glass containers. Glass is an inert container, although damage to the meat product may result from exposure to light. Glass jars are sealed with caps, twist-off lids and many other systems (crowns, side seal closures, rolled-on closure, screw caps or lug caps) and are used for frankfurters in brine and similar sausages and to some extent also for liver sausage mixtures or sausage mixtures with high-collagen content. 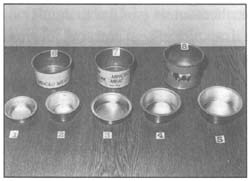 Retortable synthetic casings. Recently a new kind of casing has been used for sausage filling, especially if it is necessary to obtain a longer shelf-life for sausages, sterilized in a retort. This kind of container is sealed with clips made of aluminium. Smaller size containers are more suitable for meat canning because heat penetration of the meat is by conduction, so if larger containers are used extremely severe heat treatments will be necessary for sterilization. Such severe heat treatment will result in a much lower quality of canned product which will be extremely overcooked. That is why larger pieces, such as hams, shoulders, etc. are pasteurized at temperatures of about 80°C. Hermetic closure. 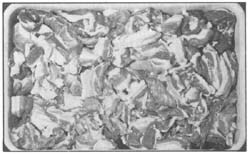 Tin-plate cans and aluminium cans are closed by machines which form a double seam in three stages: pressing the cover (lid) to the can body, forming the first operation roll seam, and forming the second-operation roll seam (Figs 199 and 200). Good double seams are absolutely essential to prevent losses due to spoilage. The food processor is responsible for the quality of seams produced in the plant and must provide adequately trained personnel to perform seam evaluations and make closing machine adjustments. Making good seams requires careful closing machine maintenance, frequent, regularly scheduled seam evaluations and immediate correction of seam conditions which are outside established tolerances. Hermetic closure of cans under vacuum is highly recommended, particularly for countries with a hot climate. 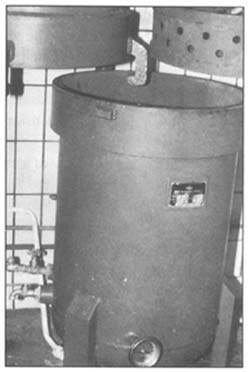 Batch retorts are heated with steam or water under pressure (Figs 201 and 202). Saturated air-free steam is an excellent heating medium for processing canned meat products. Hot water under pressure has many of the advantages of saturated steam as a heating medium but it must be circulated among containers and continually reheated. open the lid of the retort, remove baskets with canned products and let them dry. Venting is one of the most important operations in processing canned meat products in steam, because air remaining among cans in an inadequately vented retort forms an insulating layer and will reduce the efficiency of the process. In general, the same principles apply to processing in water. 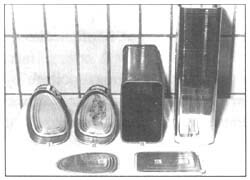 Some containers such as glass jars and flexible synthetic pouches are usually retorted in hot water in vertical retorts under superimposed air pressure. Chlorination of cooling water is recommended (0.5 ppm free chlorine should be the lowest amount at the point of discharge). Insufficient sterilization results in spoilage of canned product and is identified by can swell (hard, soft and springer swell) or by flat sour spoilage. Overprocessing results in too soft a consistency and a burnt taste. 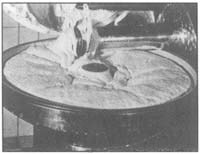 Deformation of cans and semi-rigid containers, breakage of glass jars and bursting of casings are the results of a careless, cooling operation, especially improper superimposed pressure (Fig. 204). 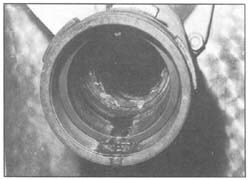 Leaking cans are the result of improper closing machine adjustment and deformation of cans prior to closing or after being processed, especially near the double seam (Fig. 203). Fully preserved canned meat products keep up to four years, but in the tropics it is only about one year. Canned pasteurized products should be clearly labelled as perishable product (keep under refrigeration or store at/below 5°C) and must not be confused with fully sterilized products which do not require refrigerated storage. Most canned meat products are eaten after emptying the can (Fig. 205), without reheating, stews and frankfurters being the exceptions. 74. 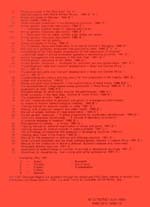 Small ruminants in the Near East, Volume III: North Africa, 1988 (E*). The FAO Technical Papers are available through the authorized FAO Sales Agents or directly from Distribution and Sales Section, FAO, Via delle Terme di Caracalla, 00100 Rome, Italy.